View More In Rice Cookers - Page 4. One-piece design for the inner pot and the enclosure.All of them are PTC fever.Why we design it? First, they are PTC heating, conjoined heating is faster and uniform. The second, conjoined micro pressure effect, the rice will be more soft.Third, the conjoined heat preservation effect can be kept for 4 to 5 hours after the power is off. 1. Lock the buckle plate when Upper lid closed. 2. Measuring and rinse rice. 1). Please use the attached measuring cup to measuring. 2). Rice cook Volume: Add standard 2 cups rice in the pot if put the steam box in side. Add 2.5 cups rice in the pot if not put the steam box inside. 3). Rinse rice: Firstly rinsing rice by other container,then put it the inner pot,please do not rinse directly in inner pot to avoid scratch the pot. 1). Add reasonable water by the reference of rice. For Example: You should add the water to the scale of the 1 cup, 2 cups, or 3 cups with the relevant rice. 2). You can choose to add or less the water according to your personal preference or the different type of rice. 3). Add the water not exceed the water level scale line "4" when not put the steam box inside. Add the water not exceed the water level scale line "3" when put the steam box inside. 4. According to the arrow of the upper lid. In clockwise direction rotating the upper lid. Connecting the coupler with Power cable one side, another side plug in the Power socket, the the indicator lamp on board turns light(red light), it indicates the power is on. This product has adopted small exquisite humanization design, beautiful and fashionable, including an special aluminum steam box in design. 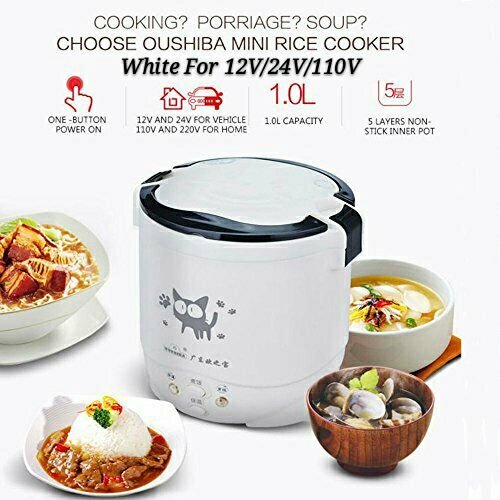 It is available for you to cook rice, congee and warm dishes in one time. It is time and energy saving product. Easy to carry, it is the first choice for the company white collar, student, the fast-pace and single person. Especially good for the small young couples. We adopt the high temperature spraying aluminum alloy non-stick environmental double-coated for the inner pot, the inner pot is easy for clean, and it is more safety to use with anti dry-fry protection. 12V For Car, 24V For Truck, 110V For Home. Pls kindly choose the right voltage for yourself. If you have any questions about this product by OUSHIBAO, contact us by completing and submitting the form below. If you are looking for a specif part number, please include it with your message.